It should come as no surprise that, for a second consecutive year, Chanelle Molina headlines ScoringLive's All-Hawaii Girls Basketball Teams. The Konawaena junior was selected by the SL staff as our Player of the Year, the second straight season she has received the honor. Molina is one of four juniors on the First Team. The others are Lahainaluna guard Cameron Fernandez, Hilo forward Alexis Pana and Roosevelt forward Keala Quinlan. Maryknoll forward Maegen Martin is the lone senior. The 5-foot-9 Molina led Konawaena to a 28-1 overall record, including a 12-0 mark in the Big Island Island Interscholastic Federation. It was the 11th league title and sixth consecutive undefeated regular season for Konawaena, which captured its sixth Division I state championship in school history and first since 2012. 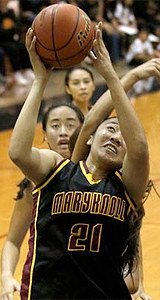 "She's definitely the best player in the state," Maryknoll coach Chico Furtado said of Molina. "She's just so poised, it almost looks like she just kind of cruises along in those games and the next thing you know, she's got 19 points, 10 rebounds. She's definitely head and shoulders above everybody else as far as what she brings to that basketball team. She makes everyone around her better and she's definitely a talented young lady." Molina averaged 17.1 points, 8.8 rebounds, 7.1 assists and 3.1 steals per game for the season. In three state-tournament games, she averaged 20.7 points, 7.7 rebounds, 4.0 steals and 1.3 steals per game. "I love watching that kid play," Hilo coach Ben Pana said. "She's the best player in the state, but she's so humble, she plays with respect for her opponents, the game and her teammates. She's a spectacular athlete and she's carried that program well over the last few years. She's very deserving of that honor." The Wildcats entered the state tournament as the top seed, but were dealt arguably the toughest road to the final. 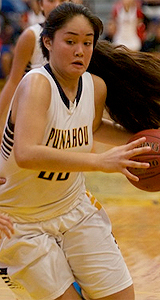 Molina powered them to a 51-37 quarterfinal win over defending champion Punahou with 16 points, six rebounds and three assists. One night later — in a 54-33 win over Roosevelt — Molina went for 19 points, nine rebounds, six assists and two steals. "In the big games she will give you the numbers, like you expect from a player like that, but what impressed me the most is how she would get the weapons they have involved in every game," Pana said. "That speaks volumes about her knowledge of the game, as far as her basketball IQ, and the kind of composure she carries herself with." Molina, however, saved her best for last. 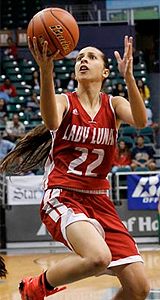 In the state championship game against second-seeded Lahainaluna, Molina shot 11 of 17 from the field and finished with 27 points, eight rebounds, three assists and two steals. 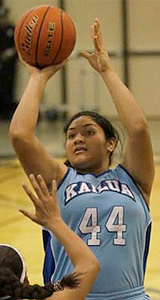 She played all but 11 of Konawaena's 96 minutes in three state-tournament games. "I think the biggest thing was when she went out of that game for a short period of time against Lahainaluna, that Konawaena team never looked the same," Furtado said. "I know they have some talented around her, but she is the hart and soul, the head of the team, and when she got back on the court, she made it a point to make plays and score or make plays and set up her teammates." 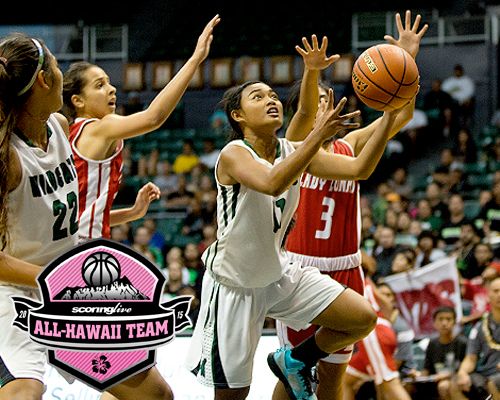 » Download a printable version of the 2014-15 Division I All-Hawaii Team. Punahou coach Kevin Velasco went beyond the statistics, when speaking of Molina's value to the Wildcats. "Everybody sees what she does on the court, as far as scoring, but I look at the little things and it's the leadership with her teammates that impresses me about her," Velasco said. "When they're in a tight situation and they might get flustered, she's there to make sure that they're okay, and to me, that's huge, that's bigger than her scoring. You know she's going to score and turn the switch at a certain point and take it to another level, but it's those intangibles that she has that makes her special. Her demeanor is always the same. You can never tell if things are going good or bad, because she's always consistent." 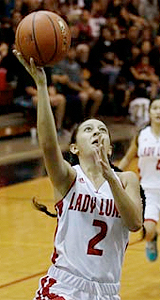 Fernandez, a 5-foot-10 wing, helped Lahainaluna compile a 20-2 record, including a 14-0 mark in the Maui Interscholastic League. 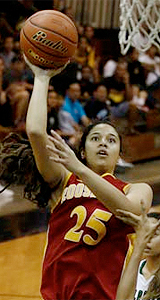 She scored a season-high 27 points, which included eight made 3-pointers, in a regular-season game against Kamehameha-Maui and averaged 13 points, 13.5 rebounds and 4.0 steals in three state-tournament games. "She gives you fits because she's so long and athletic," Furtado said of Fernandez. "If you put a guard on her you'll have a hard time stopping her from getting to the basket. If you put a post player on her, she'll step out and hit a few outside shots." Baldwin coach Angel Kalehuawehe knows all-too-well the abilities of Fernandez, who earned MIL player of the year honors as a freshman at King Kekaulike two years ago before transferring to Lahainaluna. "She's one of the most athletic players on the team and one of the top players in the league," Kalehuawehe said. "She has good jumping ability, she can shoot it, she can hit 3's, she's pretty much the full package." Pana, a 5-foot-10 wing, is a repeat First-Team selection after averaging 13.5 points, 8.0 rebounds, 4.0 steals and 6.0 assists per game. 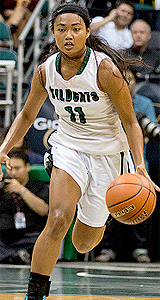 She shot 42 percent from inside the arc, 36 percent on 3-pointers and 80 percent from the free-throw line. "She's basically like Chanelle Molina for that Hilo team," said Nanakuli coach Randy Kauhane, whose team fell to the Vikings in the first round of the state tournament. "She can take the game into her own hands when she wants to, but she's very unselfish, she's very humble and she knows how to make her teammates better and that's the ideal player, someone who is going to make the team as great as they can be. That's what makes her so good." 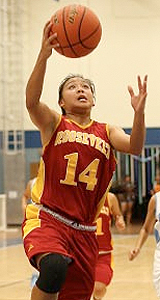 Furtado's Maryknoll squad eked out a four-point win over Pana's Hilo team in the state tournament quarterfinals. "Alexis is a quality kid and a quality player," Furtado said. "When we played (Hilo), our focus was to stop her. She's a very good player and when it comes to the state tournament and these neighbor island teams compete against Oahu teams, they prove they're good players." Quinlan, a 6-foot versatile big, helped Roosevelt to a 20-4 overall record, a perfect 14-0 league record and its second consecutive Oahu Interscholastic Association Division I crown. "She causes a lot of mismatch problems because she can hit from the perimeter when she steps out or she can produce in the post," Furtado said of Quinlan. "I think she's deserving. She's been a good player for them for a couple of years now." Kailua coach Mandy Llamedo offered high praise for Quinlan, who averaged 14.4 points on the season and 16.0 points with 10.0 rebounds and 2.0 blocks in the state tournament. "She's just a great play overall and very steady," Llamedo said. "I'd say she was the anchor for that team. There are a lot of girls on Roosevelt that contributed, but she was the piece that completed all of those great players. I think they were able to do a lot of what they did because she was there." Martin, a 5-foot-10 stalwart in the post, helped Maryknoll to a 20-3 overall record and 11-1 mark in the Interscholastic League of Honolulu. 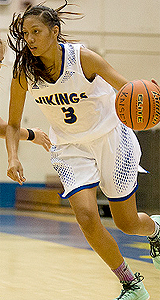 The Spartans won the league title and Martin, who averaged 11.1 points in league games, was named ILH Player of the Year. "Against us she was as good as you can be," Kamehameha coach Joseph Cho said of Martin. "She's the heart and soul of Maryknoll and we thought that if we could control Maegen, we had a shot at beating Maryknoll, but she was always a beast against us — and I mean that in the nicest way possible. She was tough for us to contain and when we did contain her, she found another way to beat us. She's an extremely, extremely talented player. In three state-tournament games, Martin averaged 15 points, 8.7 rebounds and 2.3 steals per game. "I thought she was huge for them all season," Velasco said. "A lot of the games she had to play 32 minutes and there were times that she was fatigued, but she fought through it and did the job she needed to do. She didn't always score a whole lot sometimes, but she did the little things — like playing tough defense and rebounding — and that really impressed me." Lahainaluna's Todd Rickard was selected as Coach of the Year after guiding the Lunas to their 11th consecutive MIL title and winning their 100th straight league game in the process. "He's pretty dedicated to his team," Kalehuawehe said. "He does a great job for that community and that basketball program. 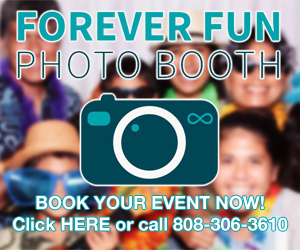 He's putting in a lot of time, he takes girls to several tournaments on the mainland and Oahu, so you know he's putting in time and money and effort and that's the result. He's a great job and I really can't say anything bad about him." The Lunas made a run to the Division I state final and came up one win short of claiming first state title since 2010 despite the loss of a trio of seniors who transferred to Konawaena during the offseason. "As much as you don't like losing that kind of talent to other schools, he rebounded and made the best of it," Furtado said of Rickard. "I talked to him about it and he wasn't complaining or bemoaning the fact that they left, he wasn't taking any cheap shots. He just moved on and he got his kids to move on, so I have a lot of respect for Todd. He does an exception job with that program out there and getting the kids to buy into their system. Ben Pana is a first cousin of Rickard and couldn't help but gush over the job he did this season. "I believe he had one senior on the team this year and the way he built that team, knowing that he would be losing quality ball-handlers and 3-point shooters, it's just like they didn't lose a step in their style of play and for him to keep that machine rolling like how they went through the season and advancing to the state finals is a testament to the hard work that he and his staff put in," Pana said. "I'm real proud of that guy." The Second Team is comprised of Roosevelt senior guard Starr Rivera, Punahou junior forward Tyra Moe, Kailua senior forward Patria Vaimaona and a pair of Lahainaluna juniors in guard Fiemea Hafoka and center Keleah-Aiko Koloi. 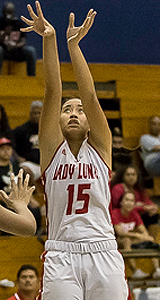 The Third Team is made up of Radford senior center Jasmine Moody and two pairs of teammates: Leilehua senior guard Jerri Maluyo and junior forward Tywanna Abbott, along with Konawaena freshman guard Cherilyn Molina and sophomore forward Celena Jane Molina.